A Late Roman helmet rather of Persian distant origin (design), decorated with semi-gemstones. The Romano-Britons inherited this type together with the rest of the Roman weaponry and military organization. In the 5th-6th centuries AD, the Anglo-Saxons brought to Britain many elements of the eastern Scandinavian Proto-Vendel and Vendel cultures, several of which are obvious on their arms and armor, i.e. 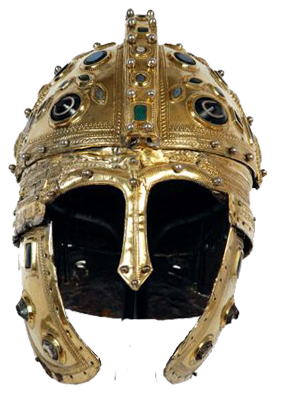 on their helmets (Sutton Hoo burial, etc. 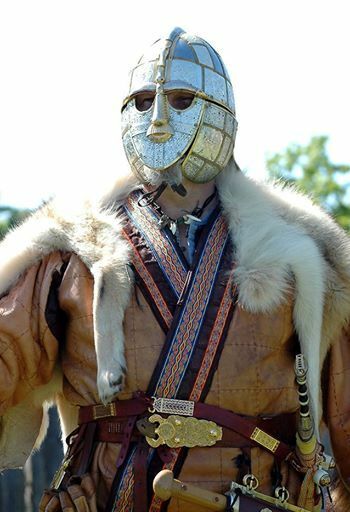 ), daggers, swords etc (reconstruction of an Anglo-Saxon warlord wearing a Sutton Hoo-type helmet, by the Historical Association Wulfheodenas ). 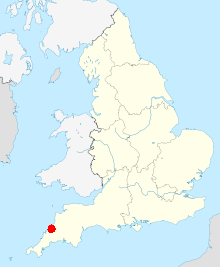 Location of Tintagel in red. 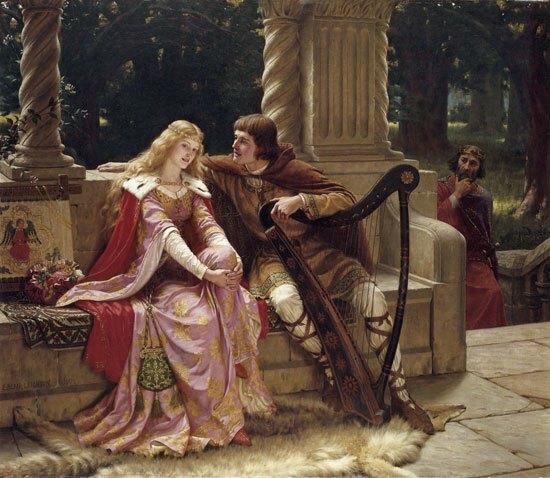 ‘Tristan and Isolde’ in a classic artwork by Edmund Blair Leighton. Tristan appears in the Arthurian Circle as a worthy knight and a romantic figure as well, but in reality he was a powerful Pict warlord. Dunstan, being his real name, was an historic figure, the champion of the Cruthni (Picts) against the Scottish invaders in Pictavia. Young Arthur was proclaimed king of the Britons when he pulled with ease Uther’s royal sword, which was spiked on a rock. The other pretenders of the throne failed when they tried to pull it. Several British archaeologists believe that the theme of the sword stuck on a rock, originates from the technical construction of the Bronze Age swords. The molten brass was poured into a stone mold, consisting of two parts which were connected tightly together by rivets. The mold was heated to the same temperature as the brass and then it was allowed to return to its natural temperature. Then the coppersmith removed the nails that held the two parts of the stone cast and pulled (using muscular effort) the sword that had been formed, as did Arthur with Uther’s sword. However, in my opinion this explanation is not convincing. The Sarmatian origin of the legend of the sword spiked on a rock is more likely (link). The Sarmatians were an important North Iranian people of the Eurasian steppe, whose branches were scattered and settled in various regions of Europe, including Britain (members of the Iazygae and Alani tribes, as mercenaries of the Romans). It is significant that their main deity was worshiped in the form of a sword spiked on the ground or on a rock. Concerning the second magical sword, according to legend when King Arthur needed a new sword, the Lady of the Lake emerged from the water and handed him the sword Excalibur.